It is not well known, but Bion gained streetfighting skills in the rough backstreets of Athens as a young lad. 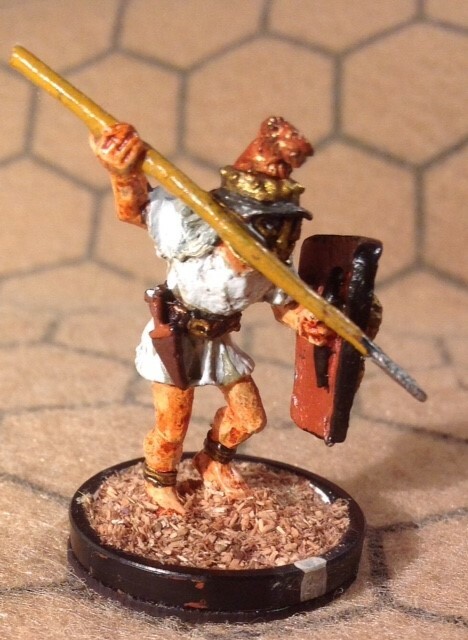 He was forced into becoming a gladiator to pay off gambling debts. He was told that he could make a good cestus fighter, but Bion preferred to don the national hoplomachus style of his countrymen. Bion is also considered to be an astute gambler; the gossip in the ludus is that he has already paid off his debts from a number of windfalls but chooses to fight on voluntarily. Observers of the breakfast fight judged that Bion tricked Asiaticus into defending high while Bion hit low. A trait learned from Bion's old streetfighting days. However, this was all academic to Asiaticus, whose life became even more miserable. As punishment for his poor performances, he was given the duty to clean out Rufus's kennel daily, which was work normally done by household slaves. It was thought by Androcles that the match up with Senex was odd, being pitted against a lesser gladiator. “Must be some strange things going on” he murmured. 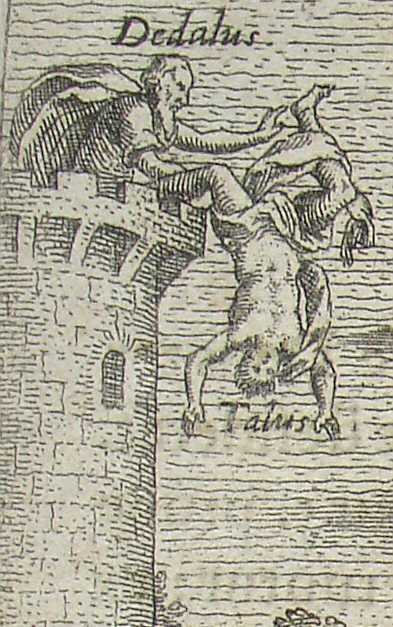 Corax had previously defeated Senex, so it was widely thought he will easily dispose of Asiaticus. Asiaticus didn’t know what to think, if he lost again, would Androcles lose patience with him? Yes, no-one would want to be in Asiaticus's sandals at the moment. And yet somehow he survives, although he has seen many "better" fighters perish. The Gods can move in mysterious ways. Anyway, the day of the new Games dawned and once again it turned out that Senex and his opponent were to go on in the morning session, with Asiaticus's bout just after the lunch break. Here is how it all transpired. Senex has the Attack and Stamina skills, Botanicus has the Popularity skill (there's maybe a back story there if needed). Senex entered the arena with a Strength score of 12 while Botanicus came in with only 5! (A 6-1 dice roll split + Senexes stamina advantage). Androcles and Quadratus were feeling confident about this one, as they had been tipped off by a source in the other ludus that Botanicus had diarrhoea. Why was he not 'scratched' from the lineup then? The two fighters got straight down to it, Botanicus not showing any obvious signs of illness. First blood to Senex causing one wound. 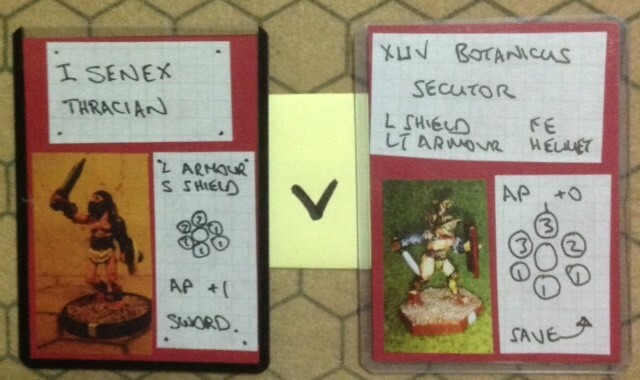 Botanicus struck back, a wound to Senex followed by a shield bash that put him on the ground. Senex got up, and the fight continued with several rounds of indecisive sparring and a few fatigues building up. Then Senex scored a quick hit that took Botanicus down to 0 Strength and it was all over. He rolled a modified 11 for his appeal so was granted Missio. The crowd digested this one sided result over lunch, with their turnips, and the more they thought about it the less they liked it. Something was obviously not right. The losing punters felt especially aggrieved. Settling back onto the benches after lunch, they wondered if the first afternoon fight had also somehow been "arranged". Asiaticus was a known loser, and his opponent Corax was considered superior on all points, so no one expected much of a spectacle. Hmm. Asiaticus, with the Dodge skill, rolled high and came on with a Strength of 10. Obviously that regime of kennel cleaning has toughened him up. Or a realisation that this is probably a "do or die" moment for him. Corax, the cool professional, came in with a Strength of 8 and the Attack and Dodge skills. They looked evenly matched at first, even rolling identical AP dice in the first few rounds. Corax struck first, two wounds to Asiaticus's shielded side. He hit back immediately with an identical result on Corax's shielded side. The fight then moved into another phase, with Asiaticus trying to bustle Corax, and Corax trying to step back to use his long spear. The only result was fatigue building up on both sides, tho Asiaticus was unlucky to fail in an attack on Corax's unshielded side. Corax achieved a "double 4" special event to floor Asiaticus but could not take advantage. He tried a big double attack but only succeeded in building 2 more fatigues, one for the spear failure and one for the bash failure. More inconclusive sparring then resumed. Then Asiaticus made a big score, taking 4 wounds off Corax in an attack on his unshielded side. Corax was now down to only 2 Strength, with 4 fatigues (exhausted). Asiaticus was at 8 Strength and 4 fatigues. Corax's response was a "double 1" special event, losing his spear which fell in the hex separating the two fighters. 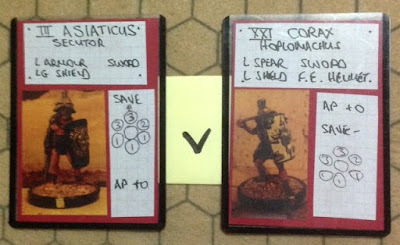 Asiaticus moved up to prevent Corax retrieving the spear, and delivered another 4 wounds, taking Corax to -2 and submission. Corax rolled a modified 6 for his appeal, so Asiaticus completed a successful day at the office by dispatching his badly wounded opponent. On his way out of the arena, he glanced up at the sky. A flight of birds passed overhead in an auspicious formation. Was his luck changing?